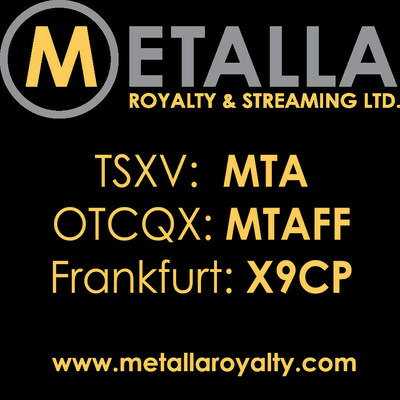 VANCOUVER, Jan. 25, 2019 /CNW/ - Metalla Royalty & Streaming Ltd. ("Metalla" or the "Company") (TSXV: MTA) (OTCQX: MTAFF) (FRANKFURT: X9CP) announces its financial results for the second quarter of fiscal 2019. For complete details of the condensed interim consolidated financial statements and accompanying management&apos;s discussion and analysis for the six months ended November 30, 2018, please see the Company&apos;s filings on SEDAR or the Company&apos;s website (http://www.metallaroyalty.com/). "In the second quarter Metalla has continued to execute on its strategy of acquiring royalties on properties with world-class operators," commented Brett Heath, President, and CEO of Metalla. "We are pleased to have completed the acquisition of a 2% NSR royalty on Agnico Eagle&apos;s Santa Gertrudis Mine along with a 1.5% NSR royalty on Pan American Silver&apos;s COSE Mine, which complements our portfolio of high-quality assets with strong counterparties." declared and paid a monthly dividend of $0.0015 per share. Estimate based on an expected average silver price of US$16.00 per oz. and a foreign exchange rate of US$0.80/C$1.00. The presentation of this non-IFRS measure is intended to provide additional information and should not be considered in isolation or as a substitute for measures of performance prepared in accordance with IFRS. Other companies may calculate these non-IFRS measures differently. Please refer to the section "Non-IFRS Financial Measures" below for a discussion of these non-IFRS measures. The Company expects to provide guidance for fiscal year ending May 31, 2020, in March – April 2019. The Endeavor Mine located in New South Wales, Australia was once the region&apos;s largest zinc, lead, and silver producer. Commissioned in 1983 as the Elura Mine, the site has been operated by CBH since 2003 and was then renamed as the Endeavor Mine. The orebody at the Endeavor Mine has the form of massive vertical pillars, which is similar to others found in the Cobar Basin. Extraction of approximately 30 million tonnes has occurred to date. Metalla has the right to buy 100% of the silver production up to 20.0 million ounces (7.1 million ounces have been delivered as of November 2018) from the Endeavor Mine for an operating cost contribution of US$1.00 per ounce of payable silver, indexed annually for inflation, and a further increment of 50% of the amount by which silver price exceeds US$7.00 per ounce. In May 2018, the Company released an updated mine plan from CBH, which increased the existing silver reserves by nearly 1 million silver oz. and extended production through to December 2020(2). CBH also had exploration success at depth with a new zone called the "Deep Zinc Lode," which has the potential to extend the mine life even further. The Company expects further drill results on the Deep Zinc Lode in the first half of the calendar year 2019 with an updated mine plan in Q4 of calendar 2019. A 2.0% NSR royalty payable by Pan American Silver Corporation ("Pan American") on minerals mined from the concessions form part of Joaquin Project located in central Santa Cruz Province, Argentina, 145 kilometers from Manantial Espejo silver-gold mine owned by Pan American. Pan American has announced (see Pan American&apos;s news release dated January 21, 2019) that it expects Joaquin to start production in the third quarter of the calendar year 2019, which is three to six months earlier than previously stated production start date. A 1.5% royalty is payable by Pan American on minerals mined from the concessions which form the Cap-Oeste Sur East ("COSE") Property Project located in central Santa Cruz Province, Argentina. The COSE Property is a fully-permitted mine that has been developed by Pan American for a total cost of approximately US$23,900,000 since its acquisition from Patagonia Gold for US$15,000,000 in May 2017. Pan American has provided guidance (see Pan American&apos;s news release dated January 21, 2019) for a later startup of COSE production related to a change in the mining method. The modification takes into account the current ground conditions and directly transfers the existing miner expertise from the Manantial Espejo operation. The change requires additional upfront development, which is expected to result in an approximate six-month delay in commencing production at COSE now scheduled for calendar Q3 2019, which resulted in rescheduling some of the ounces originally planned for the calendar year 2019 into 2020. Agnico Eagle Mines Limited ("Agnico") acquired its 100% interest in the Santa Gertrudis gold property in November 2017. This 42,000-hectare property is located approximately 180 kilometers north of Hermosillo in Sonora, Mexico. The property was the site of historical heap leach operations that produced approximately 565,000 oz. of gold at 2.1 grams per tonne ("g/t") gold between 1991 and 2000 and includes substantial surface infrastructure already in place, including pre-stripped pits, haul roads, water sources, and buildings. An additional 5,800 meters of drilling was planned for the remainder of 2018. Agnico expects to report its initial mineral resource estimate for the Santa Gertrudis project in mid-February 2019. A 2.0% NSR royalty is payable by Osisko Mining Inc. ("Osisko") on certain claims of the Garrison Project (the "Garrison Royalty"), which covers the Garrcon and Jonpol properties, and the eastern portion of the 903 Zone. The Garrison Project is located approximately 100 kilometers east of Timmins, Ontario, and 40 kilometers north of Kirkland Lake. It resides along the famous Golden Highway in the Timmins and Kirkland Lake region which has historically produced over 100 million ounces of gold. The Garrison Project is 100% owned by Osisko and consists of a portfolio of properties spanning a 50-kilometer distance along the Destor-Porcupine Fault Zone, encompassing 16 noncontiguous properties, including the Garrcon and Jonpol properties, 903 Zone, and Buffonta, and Golden Pike advanced exploration properties. As at the end of January 2018, Osisko has completed 90,000 meters of new drilling since the 2014 resource update to complement the 108,000 meters drilled at Garrison by previous operators. Osisko expects to release an updated resource estimate in the first quarter of the calendar year 2019. Metalla has a 15% ownership interest in Silverback which owns a 100% silver stream on the New Luika Gold Mine ("NLGM") operated and owned by Shanta Gold Limited ("Shanta"). The low-cost New Luika Gold Mine, which is located in the Songwe District of South Western Tanzania, approximately 700 kilometers south-west of Dar es Salaam, achieved its first commercial production in 2012. The ore bodies at New Luika comprise high grade (>6 g/t gold), medium grade (3 to 6 g/t gold), and low grade (1 to 3 g/t gold) ore which overall averages 3.9 g/t gold. Drilling is planned for the middle of the first half of the calendar year 2019 at the high-grade Bauhinia Creek underground deposit. The growth of NLGM&apos;s reserve base will be a key focus in 2019, and the annual exploration budget has been approximately doubled to US$3,600,000 compared with 2018. Metalla owns a 2.0% NSR royalty payable by Goldcorp Inc. ("Goldcorp") on the Hoyle Pond Extension Royalties, which are located on claims that are beneath the Kidd metallurgical complex and immediately adjacent to the east and northeast of the Hoyle Pond mine complex. There is a 500,000 oz. Au exemption on the leased mining rights. Goldcorp is expected to deliver its 2018 annual work report to the Company by the end of February 2019 outlining the drilling on the royalty claims which was part of a program in 2018 that focused underground on the extension of the Hoyle Pond Mine. The scientific and technical information contained in this press release has been approved by Charles Beaudry, M.Sc., P.Geo. and géo., a qualified person within the meaning of NI 43-101. Neither the TSX Venture Exchange nor its Regulation Services Provider (as that term is defined in the policies of the TSXV) accept responsibility for the adequacy or accuracy of this release. No securities regulatory authority has either approved or disapproved of the contents of this news release. The securities being offered have not been, and will not be, registered under the United States Securities Act of 1933, as amended (the &apos;&apos;U.S. Securities Act&apos;&apos;), or any state securities laws, and may not be offered or sold in the United States, or to, or for the account or benefit of, a "U.S. person" (as defined in Regulation S of the U.S. Securities Act) unless pursuant to an exemption therefrom. This press release is for information purposes only and does not constitute an offer to sell or a solicitation of an offer to buy any securities of the Company in any jurisdiction. Note 1 – The items marked with a "(1)" are alternative performance measures and readers should refer to non-international financial reporting standards ("IFRS") financial measures in the Company&apos;s Management&apos;s Discussion and Analysis for the six months ended November 30, 2018 as filed on SEDAR and as available on the Company&apos;s website for further details. Metalla has included certain performance measures in this press release that do not have any standardized meaning prescribed by IFRS including average cash cost per ounce of attributable silver, average realized price per ounce of attributable silver, and cash margin. Average cost per ounce of attributable silver is calculated by dividing the cash cost of sales, plus applicable selling charges, by the attributable ounces sold. In the precious metals mining industry, this is a common performance measure but does not have any standardized meaning. The Company believes that, in addition to conventional measures prepared in accordance with IFRS, certain investors use this information to evaluate the Company&apos;s performance and ability to generate cash flow. Cash margin is calculated by subtracting the average cash cost per ounce of attributable silver from the average realized price per ounce of attributable silver. The Company presents cash margin as it believes that certain investors use this information to evaluate the Company&apos;s performance in comparison to other companies in the precious metals mining industry who present results on a similar basis. The presentation of these non-IFRS measures is intended to provide additional information and should not be considered in isolation or as a substitute for measures of performance prepared in accordance with IFRS. Other companies may calculate these non-IFRS measures differently. Note 2 – The disclosure herein and relating to the Endeavor mine is based on information prepared and disclosed by CBH and their parent company TOHO Zinc and can be found at http://www.toho-zinc.co.jp/. The information and data are available in the public domain as at the date hereof, and none of this information has been independently verified by the Company or is supported by a technical report prepared in accordance with National Instrument 43-101 Standards of Disclosure for Mineral Projects. While the Company has requested additional information from CBH, it has not received access to the necessary data from CBH and is not able to obtain the necessary information from the public domain to prepare a technical report and CBH has not indicated the mineral resource and/or mineral reserve category, if any, on which the information in table on "Projected Silver Production" is based. Mineral resources are not mineral reserves and by definition do not demonstrate economic viability. The project silver production contained herein may be based on mineral resource estimates that include inferred mineral resources, which are considered too speculative geologically to have economic considerations applied to them that would enable them to be categorized as mineral reserves. There is also no certainty that inferred mineral resources if used by CBH in preparing the mine plan, will be converted to the measured and indicated resource categories, or into mineral reserves, once economic considerations are applied. Readers are cautioned that inferred resources have a great amount of uncertainty as to their existence and as to whether they can be mined economically. As a result, the Company cautions readers that there is no certainty that the projected silver production will be realized. Specifically, as a stream holder, the Company has limited, if any, access to the Endeavor mine. The Company is dependent on, (i) CBH and their qualified persons to provide information to the Company, or (ii) on publicly available information to prepare disclosure pertaining to the Endeavor mine and generally has limited or no ability to independently verify such information. Although the Company does not have any knowledge that such information may not be accurate, there can be no assurance that such third party information is complete or accurate. This news release also contains future-oriented financial information and financial outlook information (collectively, "FOFI") about the projected silver production from the Company&apos;s silver stream on the Endeavor mine which is subject to the same assumptions, risk factors, limitations and qualifications as set forth in the below paragraphs. FOFI contained in this news release was made as of the date of this news release and was provided for the purpose of providing further information about Metalla&apos;s anticipated future business operations. Metalla disclaims any intention or obligation to update or revise any FOFI contained in this press release, whether as a result of new information, future events or otherwise unless required pursuant to applicable law. FOFI contained in this news release should not be used for purposes other than for which it is disclosed herein. Such future-oriented production information is provided for the purpose of providing information about management&apos;s current expectations and plans relating to the future. Readers are cautioned that such outlook or information should not be used for purposes other than for which it is disclosed in this news release. This press release contains "forward-looking information" and "forward-looking statements" within the meaning of applicable Canadian and U.S. securities legislation. The forward-looking statements herein are made as of the date of this press release only, and the Company does not assume any obligation to update or revise them to reflect new information, estimates or opinions, future events or results or otherwise, except as required by applicable law. Often, but not always, forward-looking statements can be identified by the use of words such as "plans", "expects", "is expected", "budgets", "scheduled", "estimates", "forecasts", "predicts", "projects", "intends", "targets", "aims", "anticipates" or "believes" or variations (including negative variations) of such words and phrases or may be identified by statements to the effect that certain actions "may", "could", "should", "would", "might" or "will" be taken, occur or be achieved. Forward-looking information in this press release includes, but is not limited to, statements with respect to future events or future performance of Metalla, disclosure regarding the precious metal purchase agreements and royalty payments to be paid to Metalla by property owners or operators of mining projects pursuant to net smelter returns and other royalty agreements of Metalla, continued ramp-up at the Endeavor Mine, management&apos;s expectations regarding Metalla&apos;s growth, results of operations, estimated future revenues, carrying value of assets, future dividends, and requirements for additional capital, production estimates, production costs and revenue, future demand for and prices of commodities, expected mining sequences, business prospects, and opportunities. Such forward-looking statements reflect management&apos;s current beliefs and are based on information currently available to management. Forward-looking statements involve known and unknown risks, uncertainties and other factors, which may cause the actual results, performance or achievements of the Company to be materially different from any future results, performance, or achievements expressed or implied by the forward-looking statements. The forward-looking statements contained in this press release are based on reasonable assumptions that have been made by management as at the date of such information and is subject to unknown risks, uncertainties and other factors that may cause the actual actions, events or results to be materially different from those expressed or implied by such forward-looking information, including, without limitation: the impact of general business and economic conditions; the ongoing operation of the properties in which the Company holds a royalty, stream, or other production-based interest by the owners or operators of such properties in a manner consistent with past practice; absence of control over mining operations; the accuracy of public statements and disclosures made by the owners or operators of such underlying properties; no material adverse change in the market price of the commodities that underlie the asset portfolio; and other risks and uncertainties disclosed under the heading "Risk Factors" in the Management&apos;s Discussion and Analysis of the Company dated September 26, 2018 filed with the Canadian securities regulatory authorities on the SEDAR website at www.sedar.com.